During their most explosive period between 1973 and 1979, Bachman-Turner Overdrive electrified the world with chart-topping rock ‘n’ roll hits like “You Ain’t Seen Nothing Yet” and “Takin’ Care of Business.” During this era, the longest-serving members of the band were Blair Thornton, Fred Turner, Randy Bachman, and Robin Bachman. 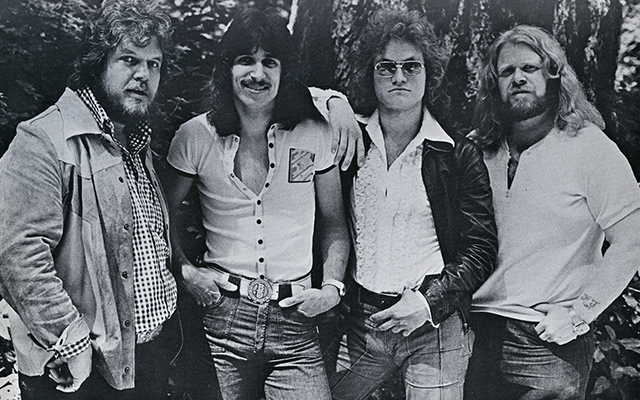 Making their self-titled debut album in 1973, the band garnered international attention for their sophomore 1973 effort, BACHMAN-TURNER OVERDRIVE II, which produced multiple hit singles, including “Let It Ride” and “Takin’ Care of Business.” The latter song has been used in over 12 movies, 24 TV shows and several dozen commercials. The band followed it up with the anthem-laden NOT FRAGILE (1974), featuring instant classics such as “Roll On Down The Highway” and “You Ain’t Seen Nothing Yet,” which sold several million singles, and went to #1 in 21 countries. NOT FRAGILE climbed to #1 on both the U.S. and Canadian album charts and sold eight million copies. The album and single “You Ain’t Seen Nothing Yet” were simultaneously #1 in Billboard, Cashbox and Record World. When NOT FRAGILE was #1, the band had two other charting albums in the top 50: BTO II at #18 and BTO I at #48. During the last four U.S. presidential campaigns, both candidates have used either “You Ain’t Seen Nothing Yet” or “Takin’ Care of Business” as campaign songs until they were served with cease and desist orders. Actor Will Ferrell has featured BTO songs in two movies: “Takin’ Care of Business” in The Campaign, and “Let It Ride” in Anchorman 2: The Legend Continues. FOUR WHEEL DRIVE and HEAD ON were both released in 1975, producing hits such as “Hey You” and “Take It Like A Man.” Other ’70s releases included FREEWAYS (1977), STREET ACTION (1978) and ROCK N’ ROLL NIGHTS (1979). Bachman-Turner Overdrive became renowned for deft songwriting, heartfelt vocals, mesmerizing guitar solos and hook-driven bass and percussion. The group stood out amidst their 1970s contemporaries for merging country music influences with a fiery brand of guitar-heavy classic rock, and received acclaim for their energetic live performances. The band won seven JUNO Awards in the 1970s, including Most Promising Group of the Year (1974), and Group of the Year in both 1975 and 1976. They received JUNO Awards for Contemporary Album of the Year in 1974 (for their self-titled debut) and Best Selling Album in both 1975 and 1976 for, respectively, NOT FRAGILE and FOUR WHEEL DRIVE. “You Ain’t Seen Nothin’ Yet” was awarded Single of the Year in 1976.